I could not believe it, so bizarre it was, and indeed I had only found a reference to this subjet. J. E. GORDON, in Structures or Why things don’t fall down (Pelican Books, 1978, pp. 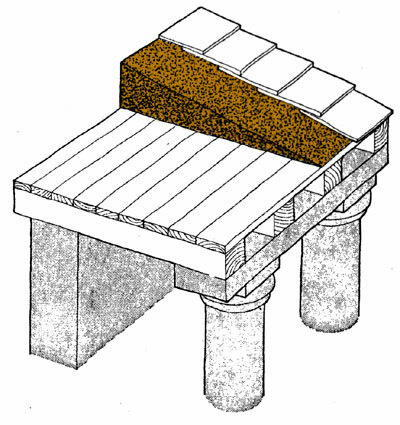 216–18) says that roofs of Greek temples were completely crammed with a mixture of damp clay and earth, so that a roof might weigh some 3,000 tons (illustration at bottom). He supposes that the plaster filling was a protection against the rain. But such a pile of earth could not have the purpose of isolating the building from the rain. The roofs ot Greek houses were accurately waterproofed by means of beams and tiles. A more elaborated explanation arguess that “we must infer that this decision was taken on some moral or religious principle” (here). Here we are an obscura per obscuriora, which doesn’t explain anything, but keeps the problem unsolved. As to myself, the only explanation I can find for this new anomaly in the temple architecture is not of a practical order, obviously, neither moral or religious. It is an iconic reason, connected with the nautical hypothesis of the origine of Greek architecture. Remember: a Greek temple intends to represent a boat overturned and stored upon support walls. In ancient ships, such as the one of Ulubun shipwreck (s. XIV adC), the more frequent way of storing the cargo was to put it on a sand bed. So to speak, seamen sailed upon floating isles. If the temple is actually an overturned boat, its roof crammed with earth represents this mass of sand full of merchandise. We can go further in the hermeneutics of the allegory that a Greek temple consists in. Both East and West pediments of the temple are the result of cutting the hull, so that they allow to see the inner cargo. What we find in the pediments are groups of statues. Exceptionally we will act as literal-minded and deduce that the boat figured in the temple ships a cargo of statues of gods, made in marmor or bronze. Before the invention of coinage, the wealth was piled up as luxury objects, sometimes sculptures or ἀγάλματα. The Parthenon itself got its name from the group of sculptures of girls, πάρθενος, which were kept on the opisthodomos of the temple, and the treasuries of panhellenic sanctuaries expressed in the same way the wealth of the contributing cities. Temples themselves were nothing but recipients in which statues, some of them extremely expensive as the chysoelephantine ones made by Phidias, were exhibited. Thus a boat full of statues of gods could have been for the Greeks the most complete image of wealth, and the most spectacular technique for making visible the superiority of a political system.